A KEY TO ABUNDANT LIVING HUSBANDS - Love Your Wives! 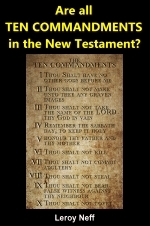 Are all TEN COMMANDMENTS in the New Testament? Many people believe that all of the Ten Commandments were done away at the cross. Some say that the commandments were reinstituted later in the New Testament. Others believe that a new commandment has taken the place of the Ten. Just what is the truth? Jesus said, "If thou wilt enter into life, keep the commandments" (Matthew 19:17). Did He mean the Ten Commandments or some other commandments? If you love Jesus Christ you will want to know for sure which commandments He was referring to. Your eternal salvation is at stake! There is no reason for confusion. The Scriptures will show the truth if you diligently search for God's inspired answer. In answer Jesus quoted five of the Ten Commandments listed in Exodus 20. "Jesus said, Thou shalt do no murder, Thou shalt not commit adultery, Thou shalt not steal, Thou shalt not bear false witness, Honour thy father and thy mother..." (Matthew 19:18-19). He then summed up these five commandments (verse 19) by saying, "Thou shalt love thy neighbour as thyself." The five commandments that Jesus mentioned concerned our relationship with our neighbors. They were the commands concerning murder, adultery, stealing, lying, and honor to parents. Obviously, when Jesus used the word "commandments," He was referring to the TEN Commandments of Exodus 20 and Deuteronomy 5. Even though Jesus mentioned half of the Ten Commandments here, some might suppose that things changed after the cross. In order to make sure, we ought to search and see if the other New Testament writers mentioned all or just part of the commandments. We will see if all ten commandments are found in the words of Jesus and, in addition, the letters of the apostles, particularly the writings of Paul, the apostle to the Gentiles. We cannot love God properly if we do not love our neighbor, so let us see if the last six commandments concerning our neighbor are reiterated. The fifth commandment from Exodus 20 states: "Honour thy father and thy mother...." We have already read what Jesus said in Matthew 19:19: "Honour thy father and thy mother." Did Paul, the apostle to the Gentiles, mention this commandment in his writings? He most certainly did! He repeated it almost word for word, and in addition explained the spiritual intent and purpose of this law: "Children, obey your parents in the Lord: for this is right" (Ephesians 6:1). Paul's next statement quotes the fifth command, adding the fact that this is the first commandment with promise. The sixth commandment against committing murder has already been given by Jesus in Matthew 19:18: "Thou shalt do no murder." He explained the spiritual intent and purpose of this command in Matthew 5:21, 22: "Ye have heard that it was said by them of old time, Thou shalt not kill; and whosoever shall kill shall be in danger of the judgment: but I say unto you, that whosoever shall be angry with his brother without a cause shall be in danger of the judgment." This command is therefore more binding in its spiritual intent and purpose in this New Testament time than it ever was before. Jesus Christ was fulfilling the prophecy of Isaiah proclaiming that the Christ, when He came, would "magnify the law" (Isaiah 42:21). Paul repeated this command in Romans 13:9. It is still a sin to murder another human being. The next command forbids adultery. Many people want to do away with this command today. But Jesus showed that it is more encompassing now than before the New Testament period. He also emphasized its importance and the spiritual application today when He said that it is wrong now even to lust after a woman. "But I say unto you, that whosoever looketh on a woman to lust after her hath committed adultery with her already in his heart" (Matthew 5:28). Paul repeated this same command and showed that it was still binding even on the Gentiles (Romans 13:9). The eighth command prohibits stealing. Jesus said, "Thou shalt not steal" (Matthew 19:18), and this same command is — repeated word for word by Paul in Romans 13:9. He said: "Let him that stole steal no more: but rather let him labour, working with his hands the thing which is good..." (Ephesians 4:28). Clearly this command is also binding today, just as it was at Mt. Sinai. Today it is difficult to find a completely truthful person. It almost seems that the whole world consists of people who shade the truth, tell "white lies" or just plain "black lies." Christ commanded His followers to never lie (Matthew 19:18). Paul taught this same doctrine in Romans 13:9. "Wherefore putting away lying, speak every man truth with his neighbour: for we are members one of another" (Ephesians 4:25). It is still a capital or major sin to lie! The tenth commandment, against coveting, was not mentioned by Jesus in Matthew 19. Did He do away with this command? No, you will find it in Luke 12:15: "And he said unto them, Take heed, and beware of covetousness: for a man's life consisteth not in the abundance of the things which he possesseth." Paul wrote to the Gentiles at Rome: "I had not known sin, but by the law: for I had not known lust, except the law had said, Thou shalt not covet" (Romans 7:7). Paul also gave this same commandment in Romans 13:9. In fact, the sixth through the tenth commandments are all given here: "For this, Thou shalt not commit adultery, Thou shalt not kill, Thou shalt not steal, Thou shalt not bear false witness, Thou shalt not covet; and if there be any other commandment, it is briefly comprehended in this saying, namely, Thou shalt love thy neighbour as thyself." Notice that he agreed with Jesus and summed up the keeping of the last six commandments by stating this is the way to love our neighbor (Romans 13:9-10). If it is sin to violate one of these last six commands, then it surely must be sin to violate any of the first four, which explain the right way to love God. Certainly our relationship to God is more important than our relationship with other people. God said, "Thou shalt have no other gods before me" (Exodus 20:3). Jesus showed plainly that this command was still in effect when He rebuked Satan — "And Jesus answered and said unto him, Get thee behind me, Satan: for it is written, Thou shalt worship the Lord thy God, and him only shalt thou serve" (Luke 4:8). This command against idolatry is mentioned many times elsewhere in the New Testament. Notice Paul's instruction to the church at Corinth, in I Corinthians 10:7: "Neither be ye idolaters, as were some of them [the ancient Israelites]...."
The second commandment, which prohibits the worship of or bowing down before images, is given in detail by Paul in Romans 1:18-25. In this place he shows that the pagan philosophers, who knew God, did not worship Him as God. Instead they began to worship the things that they made with their hands. These people were violating the command of God against making images and using them in their religious worship. Jesus taught that God is a Spirit and we must worship Him in spirit and in truth (John 4:24), not through idols, or the things made by man. The third command prohibits using God's name in vain. It is often referred to as a sin of blasphemy. This sin is mentioned several times, including Paul's statement in Colossians 3:8: "But now ye also put off all these; anger, wrath, malice, blasphemy, filthy communication out of your mouth." Jesus showed that this commandment and several of the others are still in force today by the following teaching: "For out of the heart proceed evil thoughts, murders [sixth commandment], adulteries, fornications [both of these last two are included in the seventh commandment], thefts [eighth command], false witness [ninth command], blasphemies [third command]" (Matthew 15:19). There are many additional scriptures which plainly show that these commands are still in effect. The most thought provoking of these is found in II Timothy 2:19: "Let every one that nameth the name of Christ [that is, calls himself a Christian — taking the name of God] depart from iniquity [iniquity is sin, and sin is the transgression of God's Ten Commandments — I John 3:4]." The fourth commandment is shown plainly to be in the New Testament. Have you ever read this inspired scripture? " It is therefore the duty of the people of God to keep the Sabbath" (Hebrews 4:9, New Testament from Aramaic, Lamsa). You probably have not known about this important scripture before, because the King James translation of the Bible, along with certain others, has sought to hide the real meaning of this verse. The original Greek writings and some marginal renderings make it very clear. Notice it in the King James translation: "There remaineth therefore yet a rest to the people of God." This chapter tells of the millennial rest to come for God's people who are faithful and inherit the promises of God. A "rest" is mentioned several times prior to verse nine. The Greek word for "rest" in the first part of this chapter is katapausin; however, in verse nine the word "rest" comes from an entirely different Greek word, sabbatismos. This word literally means, as most margins show, "keeping of a sabbath." The Sabbath rest each week is a memorial of creation and a picture of the soon-coming millennial "rest." Correctly rendered, this verse reads: "There remaineth therefore the keeping of the Sabbath to the people of God." Notice these points about this verse. This keeping of the Sabbath REMAINS. It is not forgotten, or done away, or nailed to the cross. And, it remains for the people of God. The rest of the world has forgotten that it still remains. If it still remains, then it is still holy to God. We ought therefore to remember it and keep it holy as God has always commanded. This day pictures the rest that God had on creation week and therefore honors the fact that He is Creator. It also foreshadows the fact that He is soon going to bring a millennium of peace, the seventh thousand-year period, to this world. The command to keep the Sabbath today is also proved by several other scriptures. Paul instructed us to follow him as he followed Christ (I Corinthians 11:1). Peter also told us that we ought to walk as Christ walked (I Peter 2:21). The apostle John said the same thing in I John 2:6. Christ always kept the Sabbath! It was His custom (Luke 4:16), and He was continually showing His disciples and the religionists of that time the proper way to keep it. He showed this by the perfect example He set. The disciples were to follow His example and teach others the same things. His parting instruction was: "Go ye therefore, and teach all nations, baptizing them in the name of the Father, and of the Son, and of the Holy Spirit: teaching them to observe all things whatsoever I have commanded you: and lo, I am with you alway, even unto the end of the world" (Matthew 28:19-20). This makes it plain that His commands, including the Sabbath, are to be observed today! Paul followed Christ in always keeping the Sabbath (Acts 17:2) and taught the Gentiles as well as the Jews on the Sabbath (Acts 13:42, 44 and 18:4). There are several other scriptures in the New Testament, particularly in the book of Acts, which show plainly that the Church, as if started out, kept the Sabbath. Sunday on the other hand was always a workday. Jesus said that He was Lord of the Sabbath, not Lord of Sunday (Luke 6:5). Sunday is not the Lord's day, and it never has been, contraryry to many very cherished beliefs. For further information about this command, write for the free booklet Which Day Is the Christian Sabbath? We have now seen that each of the Ten Commandments is commanded in the New Testament. But what about the "new commandment" that Jesus and the apostle John spoke of? Just what was this new commandment, and does it abrogate or do away with the Ten Commandments? "A new commandment I give unto you, That ye love one another; as I have loved you, that ye also love one another" (John 13:34). People assume that all we have to do is "love" one another. Then they interpret "love" to mean that they do not necessarily have to obey God's commandments. They take for granted that love is just affection. They do not realize how much Christ loved His disciples. He had the kind of love described in I Corinthians 13, the kind which always OBEYS God's Ten Commandments. He had the kind of love which caused Him to instruct His disciples, "Ye are my friends, if ye DO whatsoever I command you" (John 15:14). That is the kind of love that Christ was talking about when He told His disciples about the new commandment. Notice II John 5: "And now I beseech thee, lady, not as though I wrote a new commandment unto thee, but that which we had from the beginning, that we love one another." Love is ever new and yet old. That kind of love that Jesus and John spoke about is not just affection. People today have come to think that lust is love. Lust is getting, but love is giving and serving others in the way defined by God. The first four commandments define the way to show love to God, and the last six show the way to express love to neighbor. Any other way is not love at all, but is only lust, greed, and selfishness. The commandment of love is therefore not only the one which is given at the beginning of Christ's ministry to His disciples, but also a way of life given to the first man Adam. This kind of love is further affirmed by John: "For this is the love of God, that we keep the commandments: and his commandments are not grievous" (I John 5:3). Instead of the new commandment of love doing away with the old Ten Commandment law, this scripture shows plainly that it establishes it in this New Testament age more firmly than before. There are many religious teachers in the world today who will not keep God's commandments and, for that matter, teach that we are under a curse if we do keep them. They claim that they know Christ. Christ says differently through the apostle John: "He that saith, I know him, and keepeth not his commandments, is a LIAR, and the truth is not in him" (I John 2:4). Such people have claimed in various tracts and articles that only part of the Ten Commandments appear in the New Testament. This is a very convenient way to "do away" with any command that one does not want to obey, or does not want others to obey. The Bible plainly labels such teachers. We have already seen how each and every one of the Ten Commandments is still in effect today! Are you going to follow those who want you to disobey God and forfeit eternal salvation or are you going to obey all of God's commandments? It should be crystal clear now that all Ten Commandments are to be obeyed today! It is obvious from hundreds of Old and New Testament scriptures that they are to be followed as a way of life. These commands of God are in the Bible from Genesis to Revelation. In the very last chapter of the Bible it is made clear that the commandments are still to be obeyed. "Blessed are they that do his commandments [all of them], that they may have right to the tree of life,and may enter in through the gates into the city" (Revelation 22:14).